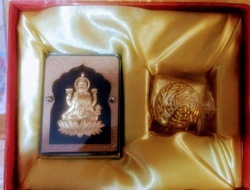 Manufacturer of a wide range of products which include gold plated laxmi car stand with shreeyantra. This Gold plated car stand contains goddess Laxmi in Car stand along with metallic Shreeyantra. Goddess Laxmi resides in the Shreeyantra. Looking for Gold Plated Car Stand ?